March for Life less than a week away!! 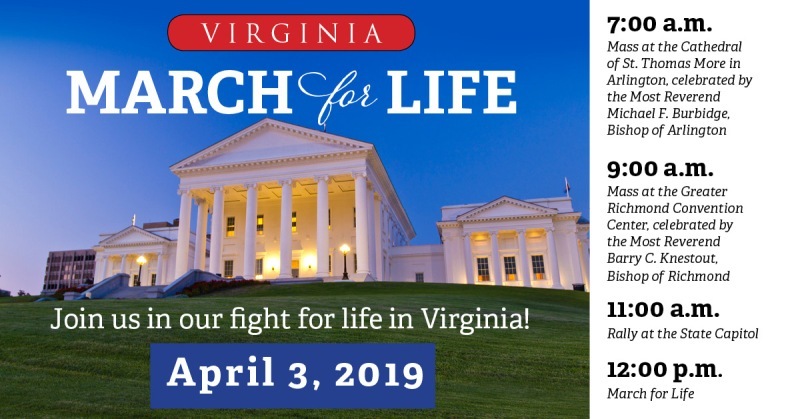 We cannot wait to see many of you for the first annual Virginia March for Life in less than a week on April 3rd! We are expecting a crowd of several thousand people! We recommend you arrive early with enough time for parking and walking to the rally site. We have updated our bus parking and individual parking information HERE. There will be volunteers and marshals with the Knights of Columbus directing you to the rally site. Please follow their directions and leading as you arrive at Capitol Square. We look forward to standing with you as we gather together on behalf of those that cannot. The Virginia March for Life is the perfect opportunity to become more involved in protecting the most vulnerable among us. Click HERE to learn more about anti-life legislative efforts in Virginia. Reminder update: Due to the incredible and inspiring level of participation in the Virginia March for Life, the venue for the Mass celebrated by Bishop Knestout has changed. The 9:00 a.m. Mass prior to the Virginia March for Life will now be held at the Greater Richmond Convention Center. The Greater Richmond Convention Center is a few blocks from the Capitol and the rally location so will be easily walkable. Buses can drop off at the Convention Center entrance located on 5th street. Parking lots and garages are located throughout the Convention Center area. For any additional questions please contact Felicia@vacatholic.org. Please spread the word and get involved! There will be many ways you can become involved in the coming year as the 2020 Virginia General Assembly session approaches. Your voice matters! Please urge people to visit www.vacatholic.org and sign up for our advocacy network.